When small birds sweetly sing. The flow’r that I lov’d so dear. But these I refused all three. And vow’d I would wait till June. Can match with the bud on that tree. And the woods lie down in the valley below. Bless the bed that I lie on. Two to bear my soul away. Pray God send me a blessed hour. The Lord, He knows if I shall wake. God receive my soul for ever. Kang, kang, kang ki ki kang kang. And first he won my heart, till he wrote to me a letter. He makes the sparks to fly all around his middle. ‘I love my Love because I know my Love loves me! Yet I love his parents since they’re his although they’ve ruined me. I love my Love because I know my Love loves me! ‘Oh yes, my dearest Nancy, I am your Love also. Like turtledoves together, in love and unity. I love my Love because I know my Love loves me. when he returns from sea. 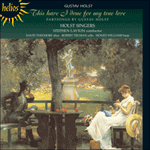 The arrangement by Holst (1874-1934) of the Cornish folk-song I love my love was composed in 1916 (shortly after the completion of The Planets) as the fifth of Six Choral Folk-Songs, Opus 36b. 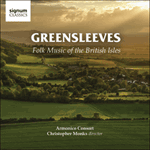 The folk-song itself was discovered by George Barnet Gardiner around 1904. The song tells of a maiden incarcerated in an asylum, mentally unbalanced after her beloved’s parents have banished their son to a life at sea. Holst’s arrangement is both dramatic and sensitive, with a successive più mosso, con passione and Vivace for the climax of the fourth verse. Once more to part from you, fine girl, you’re the girl that I adore. But still I live in hopes to see old Swansea Town once more. We’ll drink strong drinks and brandies too, to the girls that we adore. And when our money is all gone we’ll go to sea for more.